12N Proceed to Planters Memorial & Gallery at Sungai Siput (N), then back to Hotel. 1900hrs Dinner- Royal Ipoh Club - pay as you go. SUNDAY 16JUN - Sleep in. *The Rangers Camp Service on Saturday is held at 1100hrs, therefore it can be very hot. The soldiers of No 2 Royal Rangers, Kem Sued Putra, do make every effort to look after us with shade and refreshments, but carry some water, just in case. NB: The Syeun Hotel provides 2 bottles of water to your room each day...please use it for hydration...it's important your body retains moisture in this part of the world. .....if the Liaison Officer is uncontactable. MALAYSIA - What a place ? Consider seeing what Malaysia has become since "The Emergency"....You will be amazed. Further information on the country can also be obtained from the Malaysian government's official portal,http://www.malaysia.gov.my/. 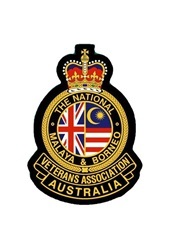 Australian passport holders do not need a visa to enter Malaysia for a visit of up to three months provided their passports are valid for at least six months on arrival and they have a return air ticket or onward ticket to another international destination. A single entry air ticket is not accepted without a confirmed date and exit from Malaysia. 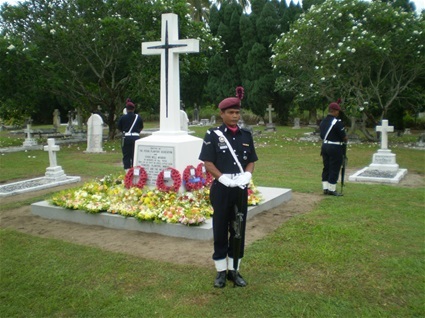 Answer: As Terendak is a Malaysian Military Camp, you need permission to visit the Cemetery. 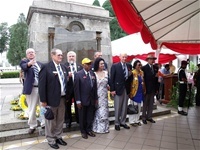 You should contact the Australian High Commission Defence military advisor well before you leave on your trip, providing the names, passport details, dates of birth and occupations of the persons concerned, as well as the date and approximate hour of the day you wish to visit the cemetery. The Military Advisor will arrange permission from the Malaysian military authorities and advise you. If you are travelling to Malaysia, whatever the reason and however long you'll be there, we encourage you to register with the Department of Foreign Affairs and Trade. You can register in person at any Australian Embassy, High Commission or Consulate or online. The information you provide will help us to contact you in an emergency – whether it is a natural disaster, civil disturbance or a family issue. In a consular emergency, if you are unable to contact the High Commission or Honorary Consulates you can contact the 24-hour Consular Emergency Centre on +61 2 6261 3305 or 1300 555 135 within Australia. Photo - The National memorial located at the Lake Gardens, KL. The huge bronze structure was designed by Felix de Weldon, creator of the Iwo Jima memorial in Washington. 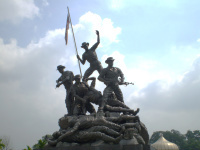 It was constructed in 1966 to commemorate Malaysia's heros, and all members of the various Security Forces and Civilians who fought during the Malayan Emergency (1948 - 1960) in the cause of peace and freedom, thereby securing the democratic success that the vibrant country of Malaysia enjoys today. 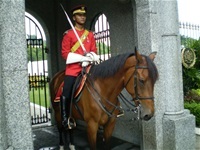 Mounted soldiers are no longer a feature t the Kings Palace. The snap was taken in 2009.